Get the Drill JDBC Driver. Put the Drill JDBC jar file on the classpath. Use a valid URL in the JDBC connection string when you write application code or configure BI tools. Use the name of the Drill driver class in application code or in the configuration of client tools. Most client tools provide a UI where you can enter all of the required connection information, including the driver location, connection URL, and driver class name. For specific examples of client tool connections to Drill through JDBC, see Using JDBC with SQuirreL and Configuring Spotfire Server. Capability to resolve the actual host name of the Drill node(s) with the IP(s), as described in step 4 of Install the Drill JDBC Driver with JReport. jdbc is the connection type. Required. schema is the name of a storage plugin configuration to use as the default for queries. For example,schema=hive. Optional. zk name specifies one or more ZooKeeper host names, or IP addresses. Use local instead of a host name or IP address to connect to the local Drillbit. Required. port is the ZooKeeper port number. Port 2181 is the default. On a MapR cluster, the default is 5181. Optional. directory is the Drill directory in ZooKeeper, which by default is /drill. Optional. cluster ID is drillbits1 by default. If the default has changed, determine the cluster ID and use it. Optional. drillbit=<node name> specifies one or more host names or IP addresses of cluster nodes running Drill. The “tries” option represents the maximum number of unique drillbits to which the client can try to establish a successful connection. The default value is 5. This option improves the fault tolerance in the Drill client when first trying to connect with a drillbit, which will then act as the Foreman (the node that drives the query). The order in which the client tries to connect to the drillbits may not occur in the order listed in the connection string. If the first try results in an authentication failure, the client does not attempt any additional tries. 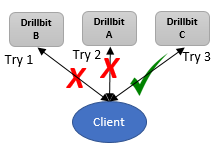 If the number of unique drillbits listed in the drillbit parameter is less than the “tries” value, the client tries to connect to each drillbit one time. If the client cannot successfully connect to any of the drillbits, Drill returns a failure message. For definitions of other URL components, see Using the JDBC URL for a Random Drillbit Connection. The class name for the JDBC driver is org.apache.drill.jdbc.Driver. For details, see the Apache Drill JDBC Driver version 1.2.0 Javadoc. As of Drill 1.13, you can use the setQueryTimeout(int milliseconds) method in the interface DrillStatement to limit the amount of time that the JDBC driver allows a query to run before canceling the query. The setQueryTimeout method sets the number of seconds that the JDBC driver waits for a Statement object to execute before canceling it. By default, there is no limit on the amount of time allowed for a running statement to complete. When you configure a limit, an SQLTimeoutException is thrown if a statement exceeds the limit. A JDBC driver must apply this limit to the execute, executeQuery, and executeUpdate methods.